The mammals (warm-blooded animals) called primates include the lower primates (lemurs, lorises, and tarsiers) and the higher primates (monkeys, apes, and humans). Mostly occurring in tropical areas, primates first evolved more than 50 million years ago from shrewlike, insect-eating mammals. Many present-day primates are arboreal (tree-dwellers), with long, agile limbs for climbing and four fingers and an opposable thumb covered by nails for grasping branches. (An opposable thumb is one that is able to be placed against the other fingers.) The eyes of primates are located in the front of their heads, allowing depth perception. Their diet consists of fruit, leaves, stems, buds, and insects, although some primates are carnivores (meat-eaters). Primates have large brains, with the higher primates showing a marked intelligence. The lower primates, including the lemurs, lorises, and tarsiers, were the first primates, occurring in North America, Europe, and Asia. Lemurs now occur only on Madagascar, an island off the coast of Africa. They are mostly tree-dwelling, nocturnal (active at night) animals with a moist snout (nose) and a long, furry tail. Lorises are slow-moving, tailless, and nocturnal and live in trees. They are found in southeast Asia and Africa. Tarsiers are small primates with large bulging eyes and a long, thin, naked tail. They are mainly tree-dwelling, nocturnal creatures of the islands of southeast Asia. Monkeys are mostly tree-dwelling, social mammals that are chiefly diurnal (active during daytime). Old World monkeys (those originating in Africa and Asia) have narrow nostrils that face downward, a fully opposable thumb, and average-sized or absent tails. Included in this group are the baboons and macaques, which are ground-dwellers. New World monkeys (those originating in Central and South America) have rounded nostrils set fairly far apart. Their thumbs are smaller than Old World monkeys, and they typically have long arms and legs and long tails for wrapping around tree limbs. Spider monkeys, marmosets, and capuchins are examples of New World monkeys. Apes—the group of primates most closely related to humans—include gorillas, orangutans, chimpanzees, and gibbons. The hands, feet, and face of an ape are hairless, while the rest of its body is covered with coarse black, brown, or red hair. Diurnal: Occurring or active during the daytime. Opposable thumb: A thumb that occurs opposite the fingers so that it can be placed against them to grasp objects. Gorillas are ground-dwelling mammals that inhabit the forests of central Africa. They are the largest and most powerful of all primates, reaching a length of 6 feet (1.8 meters) and weighing up to 500 pounds (227 kilograms). Orangutans are chestnut-colored, long-haired apes live only in the rain forests of the Indonesian islands of Sumatra and Borneo. They are the largest living arboreal mammals, spending the daylight hours moving through the forest canopy in search of fruit, leaves, tree bark, and insects. 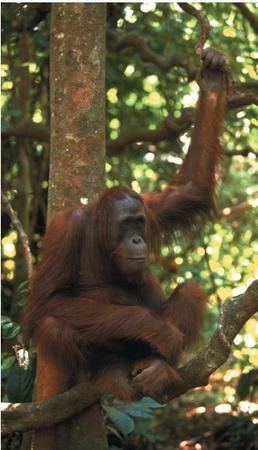 Many orangutans live to 50 or 60 years of age. Chimpanzees are partly arboreal, partly ground-dwelling primates that live in the forests of west, central, and east Africa. They are agile creatures that can move rapidly through treetops. On the ground, chimpanzees usually walk on all fours (called knuckle-walking), since their arms are longer than their legs. They make and use a variety of tools, throw sticks and stones as weapons, and hunt and kill young monkeys. Chimpanzees are the most intelligent of the apes and are capable of learning complex sign language. Their closest relatives are humans, who share much of the same genetic material. Gibbons are the smallest of the apes and are found in southeast Asia, China, and India. They spend most of their lives at the tops of trees in the jungle, using their long arms to swing their agile bodies from tree to tree in search of leaves and fruit. Gibbons are known for their loud calls and songs, which they use to defend their territory. They are devoted parents who show extraordinary affection in caring for offspring. Humans and their related ancestors belong to a group called hominids, primates with an upright posture and bipedal (two-footed) locomotion. Humans differ from apes in that their brains are larger in relation to their bodies and their faces are flatter and do not have a bony ridge over the eyes. The human skeleton is similar to that of a chimpanzee or gorilla but is modified for walking on two legs. Also, human teeth are smaller than those of apes, with the canine teeth much less pronounced. The human line split off from the one leading to chimpanzees and apes 5 million to 7 million years ago. Scatterings of fossils have led scientists to speculate that the earliest primates of any kind appeared about 55 million years ago, mainly in Asia. But just when the two lines of primates (lower and higher) separated had seemed to be lost in the wide gaps in the fossil record. In March 2000, however, scientists announced they had discovered the fossil bones of an animal they believed to be the earliest known relative in the primate lineage that led to monkeys, apes, and humans. The animal, which the scientists named Eosimias for "dawn monkey," lived some 45 million years ago in a humid rain forest in what is now China. The smallest primate ever found, alive or extinct, it was no bigger than the length of a human thumb and weighed less than 1 ounce (28 grams). It was also probably nocturnal and solitary and fed on insects and fruits. 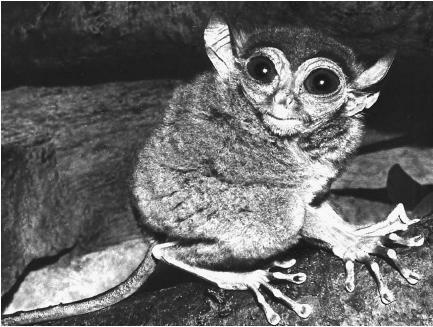 Scientists believe Eosimias to be a transitional figure when lower primates, known as prosimians, went their separate way, eventually developing into present-day lemurs, lorises, and tarsiers. Eosimias was part of the diverging higher primates, known as anthropoids, that eventually evolved into today's monkeys, apes, and humans. primate like apes is said to be the ancestors of man just because they exihibit the wide range characteristics of mammals. Most helpful. A diagram of the divergent paths and some estimate, if known, of the time frames would futher clarify the relationships. I appreciate the article and Wikepedia. Thank you. This article was extremely helpful in allowing me to simply understand the idea behind all of the information that I have learned in my biological anthropology class, that seem almost to complex to understand. with my previous knowledge and this general description it made the science a whole lot easier to understand. Thank You for such an amazing article!